If you love flaky pastries and have missed them since going gluten free, you are going to LOVE this Gluten Free Cheese Danish recipe!! 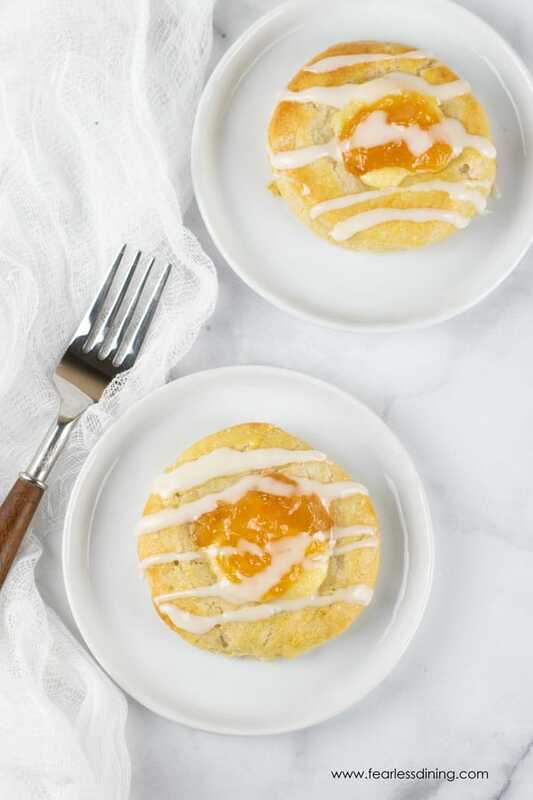 I took my most popular flaky pastry dough and took it to the next level with this easy Gluten Free Cream Danish recipe. Sweet, flaky crust filled with cream cheese and topped with a lemon sugar glaze that is decadent and unforgettable. 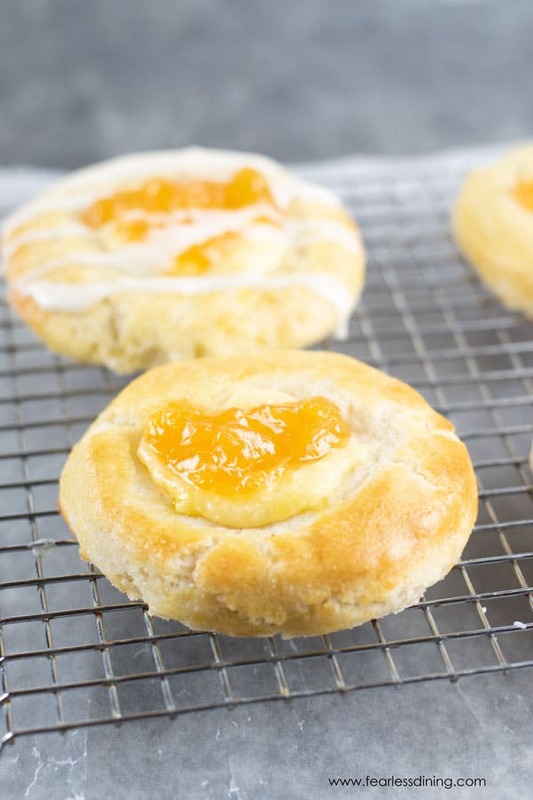 These gluten free danishes are seriously food heaven for your taste buds. 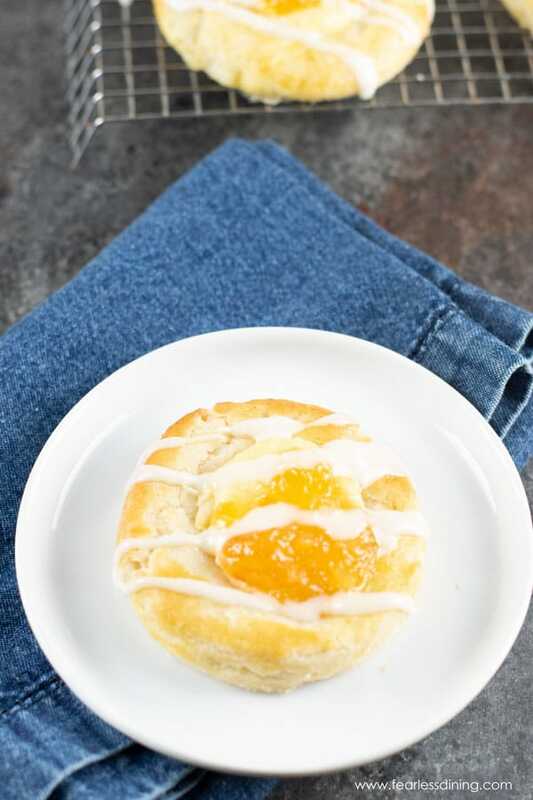 This gluten free cheese danish recipe is going to be your new favorite breakfast! When you bite into this sweet delicious danish, you will be shocked that there is no gluten in it. 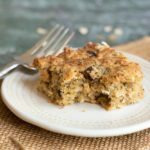 My gluten free pastry recipe has been a favorite of my readers for years, and I used it as the base for this recipe. When Mr. Fearless Dining and I went on a trip to Europe (way before we were gluten free! ), we fell in love with not only the beauty and culture but also the French and European pastries. We knew that we probably wouldn’t taste anything like them at home, but when we started making these danishes, we knew we were as close as we could get. These gluten free cheese pastries do take some time and effort, but I can promise you they are worth every single scrumptious bite!! 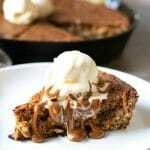 The base gluten free pastry dough for this recipe is based on my most popular Gluten Free Flaky Pastries recipe. Gluten Free Cheese Danish for Breakfast! Sometimes there is conflicting information regarding a gluten free diet. I have made this guide to help How To Eat Gluten Free Anywhere + Best Gluten Free Diet Tips. There is a lot of useful information there. 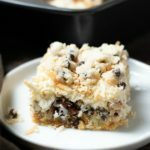 Below are some pastry questions that my readers have asked in my Flaky Pastry post, so I thought I would share some of the Q&A here in case you have questions too :-). You will have better luck if you let it rise overnight, in a cool, dry place. It may take longer, but the result is a stronger dough, and it rises better. When you ferment the yeast with warm milk make sure that it isn’t over 110 F degrees. Because milk has sugar in it when you use it to ferment your yeast the sugars will feed the yeast. I found that letting my yeast sit in the milk with a little sugar longer helps it really get bubbly and active! 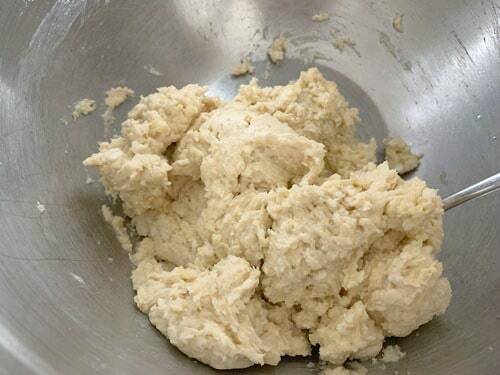 Mine sat for 15 minutes and went crazy…making this dough super puffy! Each danish has the perfect amount of flakiness and sweet goodness! Once you make this pastry recipe and figure out how versatile it is, and you will completely fall in love. Below are a few more ideas of how you can use the same recipe and merely make a few adjustments to change it up. 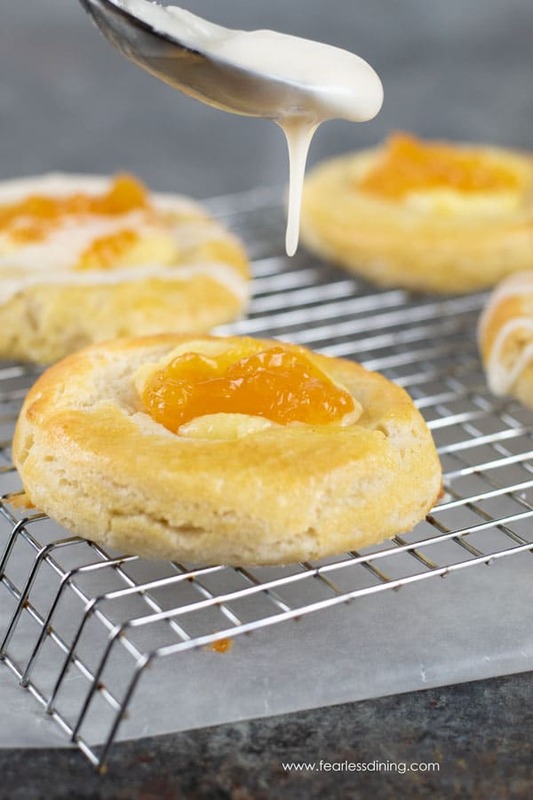 Are you ready to see how easy these Gluten Free Cheese Danishes are to make? Add the dry ingredients to a bowl and whisk to blend. 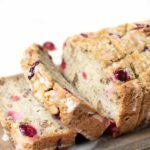 I have used a few gluten free flour blends successfully in this recipe including these specific brands: Bob’s Red Mill, King Arthur, and Authentic Foods. Note, if your gluten free flour blend doesn’t include Xanthan Gum, add one teaspoon! Add the yeast, sugar, and milk in a bowl. 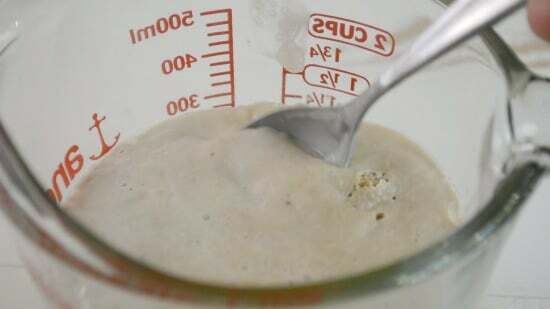 Allow the yeast to proof 10-15 minutes. 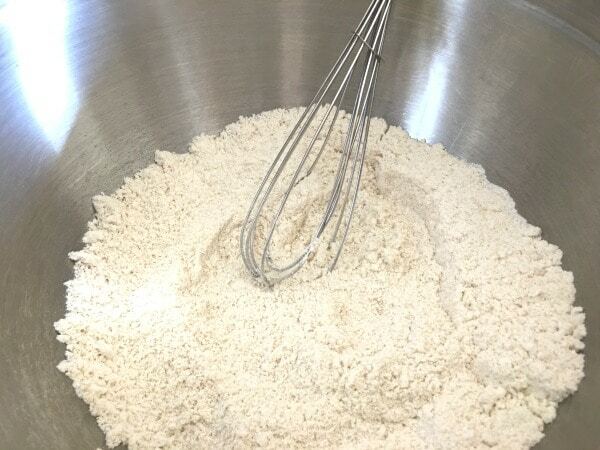 Add the yeast and wet ingredients to a bowl and whisk to blend. Let the dough sit and rise for an hour. 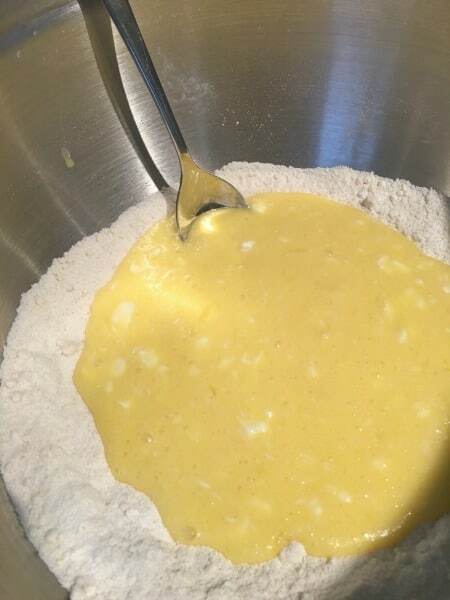 After an hour, mix the dough and add a little flour if needed. Roll out the dough on a cutting board. Add cold butter to the dough. Fold the dough over the butter and roll again. You will be repeating this process several times. If the dough is sticky, add more flour. If the dough gets too warm, put back in the refrigerator to chill. Can You Eat Butter When You Are Gluten Free? 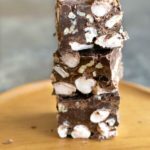 There is a LOT of butter in this recipe, so you may think of this question. Yes, you can. Organic as well as plain butter is typically gluten free. There are some varieties that add ingredients that have gluten in them, so just pay close attention to what is in the butter. You can also have most dairy products. Just read the labels and organic is always a safer bet. The dough folded over ready to roll again. Add more butter once rolled out and fold the dough back over itself again. Roll it flat again. 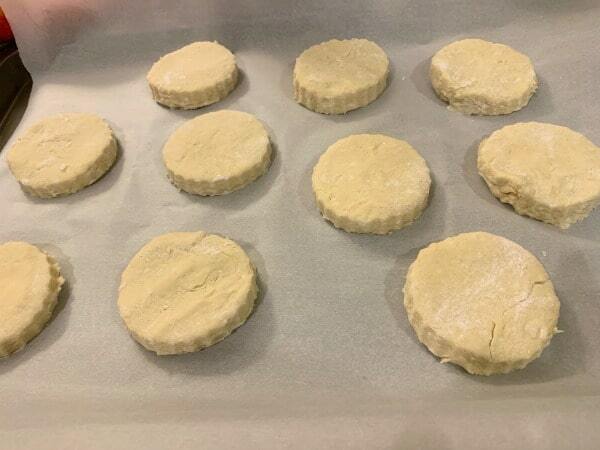 You can read more about the steps and see more pictures in my original Flaky Pastry recipe. Roll the dough flat for the last time. Grab a cookie cutter. Lay out the round dough circles on a parchment paper-lined baking sheet. Use your fingers to press down the middle in each. 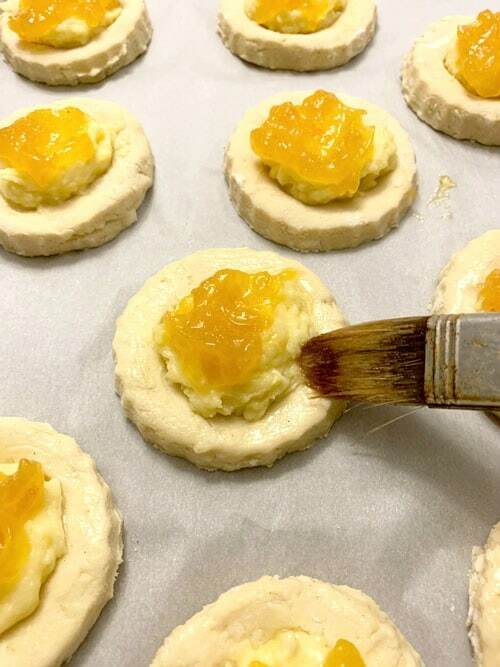 Fill each pastry circle with the cream cheese mixture and jam. What flavors of jam are best in this cheese Danish recipe? Brush an egg wash on each pastry. Bake at 350F degrees for 18-20 minutes until done. A good rolling pin. 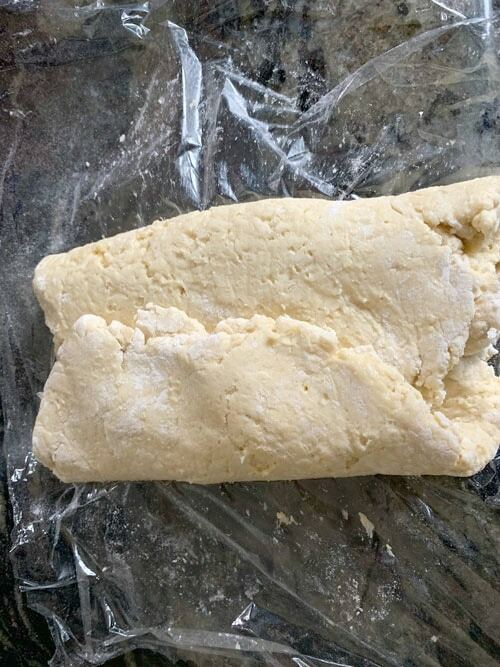 You will be rolling this dough several times with butter. I love this rolling pin because it works well and can go into the dishwasher to clean! Cookie cutters to make perfect circle shapes with the dough. 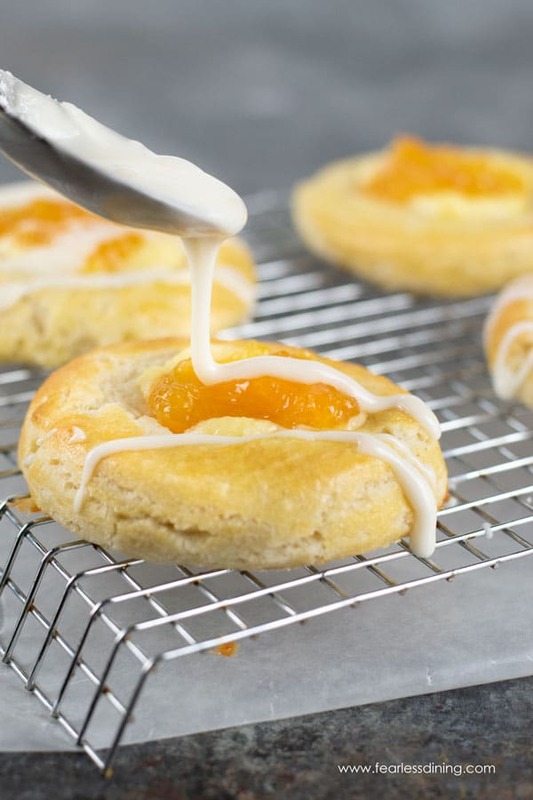 This Gluten Free Danish recipe is full of good stuff. If you love Cheese Danish, you must give this easy gluten free pastry recipe a try! In a small bowl, add the yeast, one teaspoon sugar, and warm milk. Allow sitting for 10 minutes to let it get frothy. In a medium-sized bowl, add all of the wet ingredients. Pour in the frothy yeast mixture and whisk to blend. Cover the bowl with plastic wrap and allow to rise for one hour. Place plastic wrap onto a cutting board. Sprinkle with flour. Put the dough to the cutting board. Sprinkle the top of the dough with more flour. 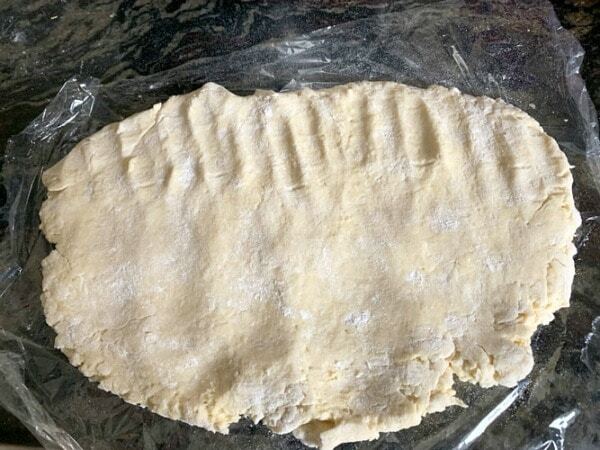 Use a rolling pin or your hands to press it flat to 3/4 inch thick. Use as much flour as needed to prevent it from being sticky. At any time you can refrigerate the dough to help. Add chunks of butter and then fold the dough onto itself. Roll flat again. Add more butter chunks and roll again. You will keep repeating this process so that you have lots of butter layers. This is what makes your pastry dough flaky. It is a bit time consuming but it is worth it! Repeat this process until you use all of the butter. Again, you will want to refrigerate the dough a bit between each butter layer. Cold butter works a lot better in making flaky layers. Make the cream cheese layer by adding room temperature cream cheese, the egg yolk, and sugar to a mixer and whip until creamy. Roll your dough to 1/2 to 3/4 inch thickness. 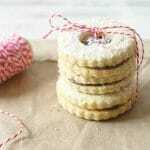 Use a cookie cutter to cut out circles, or another shape. 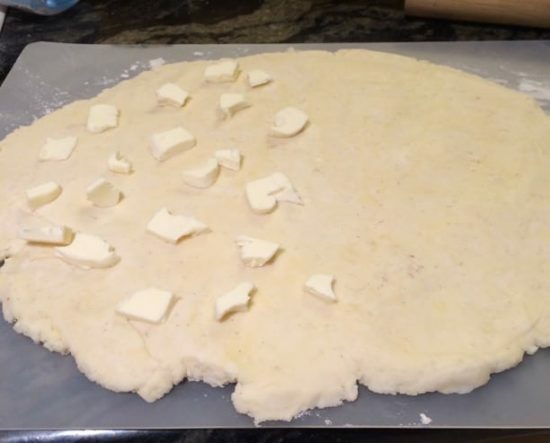 Use your fingers to press down the dough in the center of the circle. Add one spoon full of the cream cheese mixture and jam to each center. Beat an egg in a small bowl. 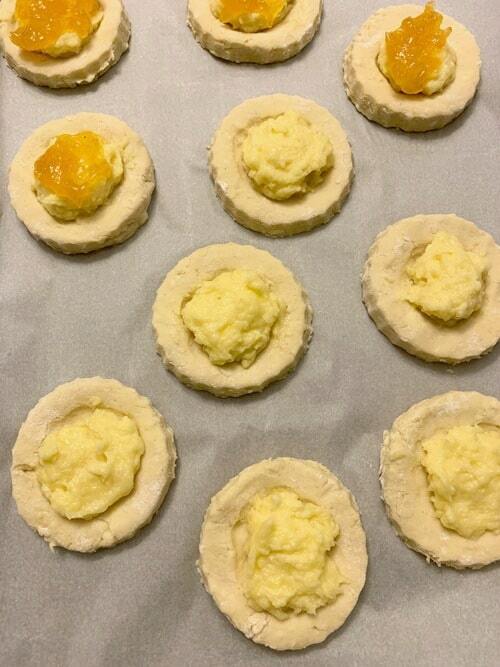 Use a brush to spread the egg onto the exposed dough of each pastry. Bake for 18-20 minutes until done. Allow cooling. Make the icing with the powdered sugar and lemon juice to a bowl. Feel free to add more lemon juice to get the right consistency. Drizzle onto each Danish. Your photos are amazing! Drooling just looking at these pics! Great recipe too. These look like they would be great any time of day, can’t believe they’re gluten free! Awww, thank you so much Sonal. I hope you enjoy them. Gluten-free recipes have come such a long way. These sound and look delicious. I would love a couple right now with my mug of green tea. A great afternoon treat. LOL I think back to when we went gluten free 10 years ago and couldn’t even buy a loaf of bread in stores! Times are so much better now. 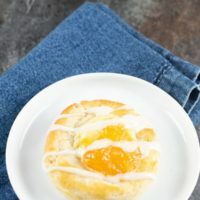 I love eating Danishes and this is so awesome that it’s Gluten-Free! Yum!